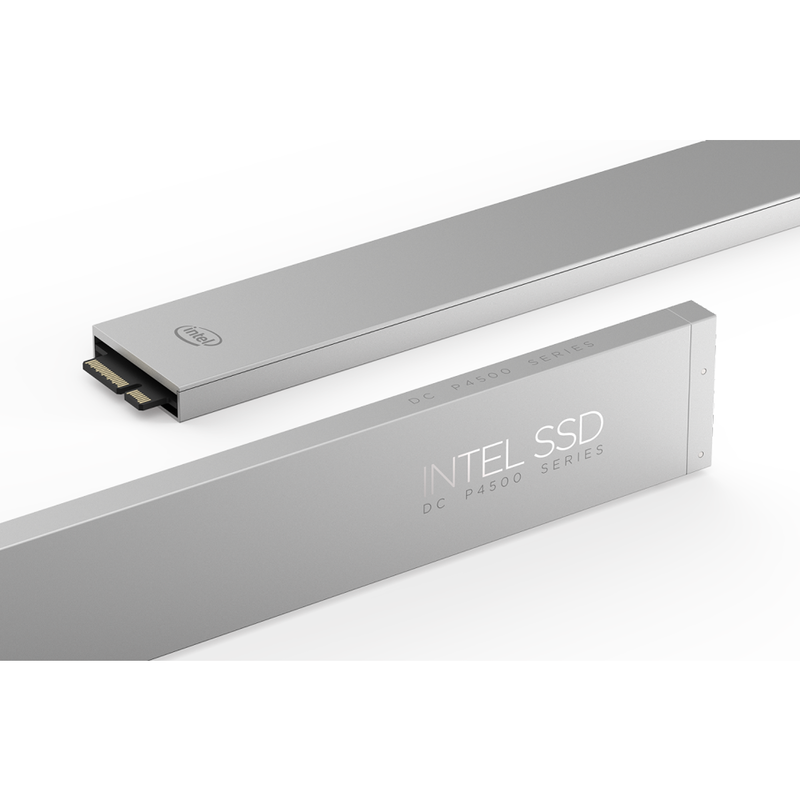 Pairing a new Intel developed controller, unique firmware innovations, and industry-leading 3D NAND density, the Intel® SSD DC P4500 Series - a member of the Intel® 3D NAND SSD family - delivers an all new design to support cloud storage and software-defined infrastructures. The Intel SSD DC P4500 Series is stacked with a combination of performance, capacity, manageability, and reliability to help data centers fast-track their business and meet the overall demands of their digital business. 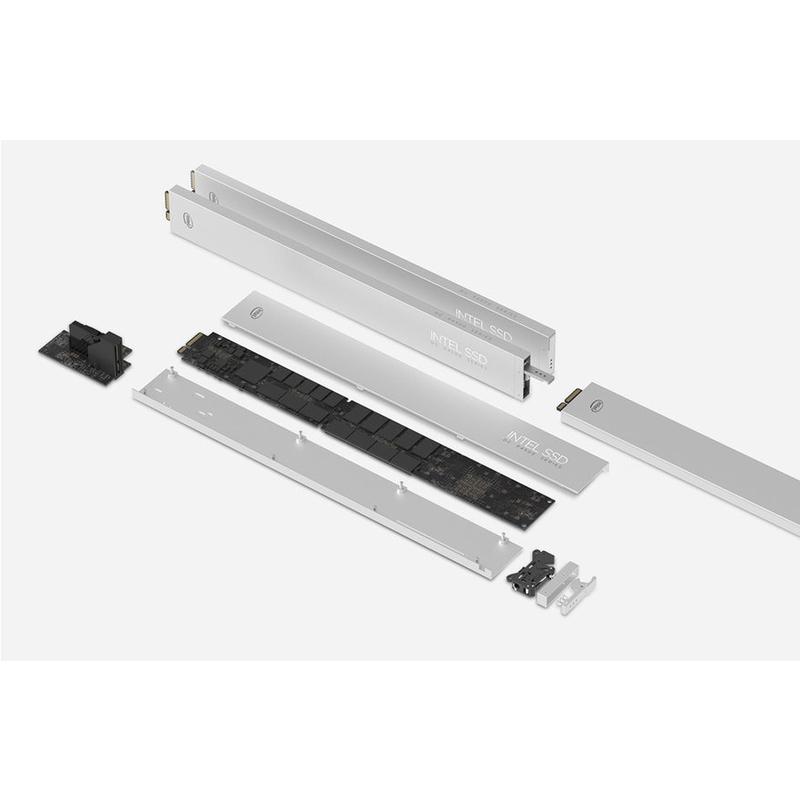 To meet data center’s exacting needs for growing capacity, easy serviceability, and thermal efficiency, the DC P4500 is now available in the revolutionary “ruler” form factor. The Intel® SSD DC P4500 significantly increases server agility and utilization, while also accelerating applications, across a wide range of cloud workloads. With controller support for up to 128 queues, the DC P4500 helps minimize the risk of idle CPU cores and performs most effectively on Intel platforms with Intel® Xeon® processors. The queue pair-to-CPU core mapping supports high drive count and also supports multiple SSDs scaling on Intel platforms. With the Intel® SSD DC P4500 Series, data centers can increase users, add more services, and perform more workloads per server, or quickly repartition to adapt to conditions. Now you can store more and know more. The Intel® SSD DC P4500 Series is built for software-defined cloud infrastructures across the multi-cloud environment to enable greater efficiency within existing server footprints. 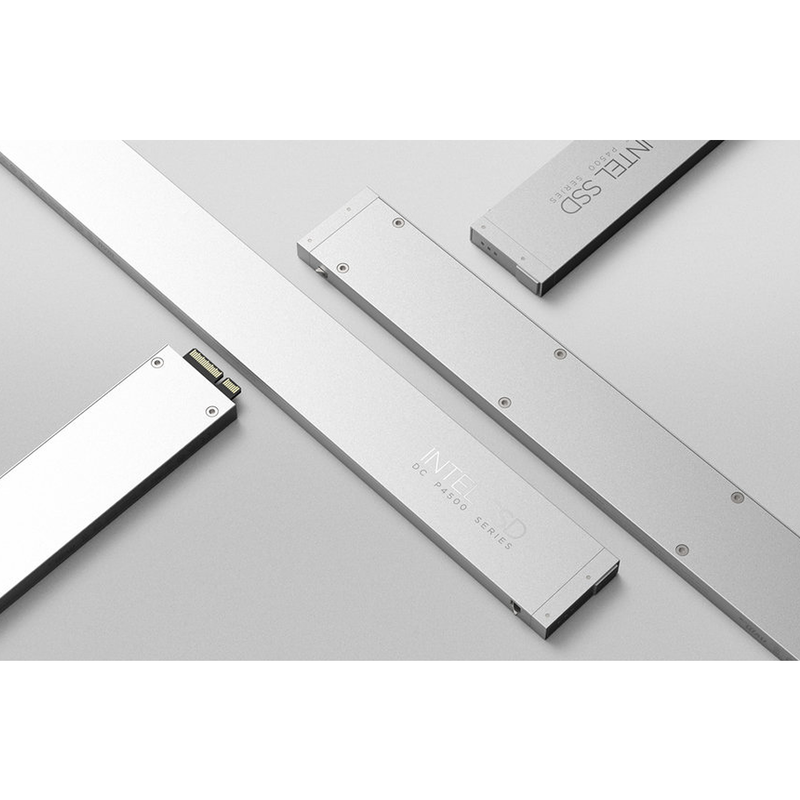 The new “ruler” form factor further improves service efficiency with support for programmable LEDs to enable indication of more device states; integrated power cycling to enable remote, drive specific reboot; and, an integrated pull latch for optimal front-end servicing. As capacity per server continues to scale, the risk of data corruption and errors increases. With an eye toward this risk, Intel has built industry-leading end-to-end data protection into the Intel® SSD DC P4500 Series. This includes protection from silent data corruption which can cause catastrophic downtime and errors in major businesses. The Intel® SSD DC P4500 Series is Intel’s new 3D NAND SSD for read-intensive workloads in cloud-driven data centers. The mix of performance, capacity, manageability, and reliability make it the ideal solution for software-defined and converged infrastructures. This cloud-inspired SSD is built with an entirely new NVMe controller, optimized for read intensive workloads and designed to maximize CPU utilization. With the Intel SSD DC P4500 Series, data centers can increase users, add more services, and perform more workloads per server. Now you can store more and know more. 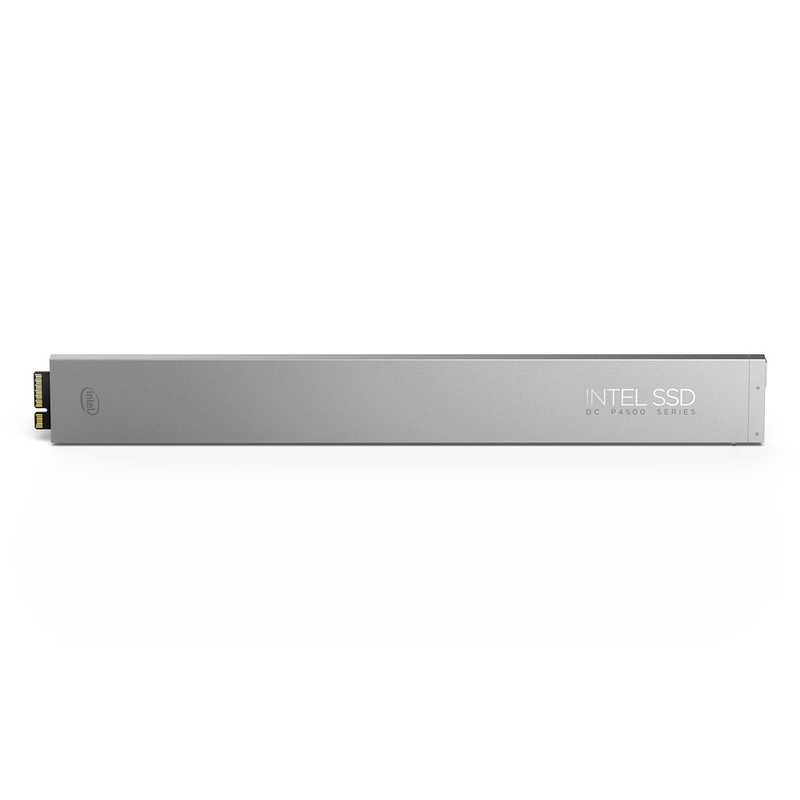 The Intel® SSD “ruler” form factor is a data center revolution inspired by customers and optimized for data centers. Free from the compromises of legacy drives, every feature was purpose built to meet your toughest challenges. Its elegant, innovative design delivers breakthrough efficiency, greater capacity and lower TCO. 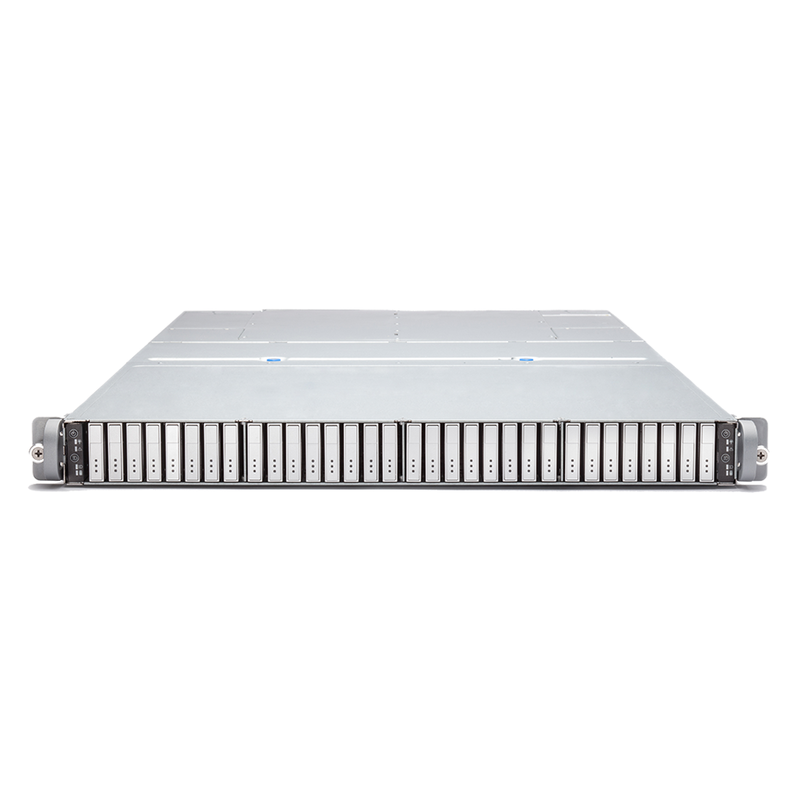 This new form factor delivers high per-drive, per-server, and per-rack capacity. 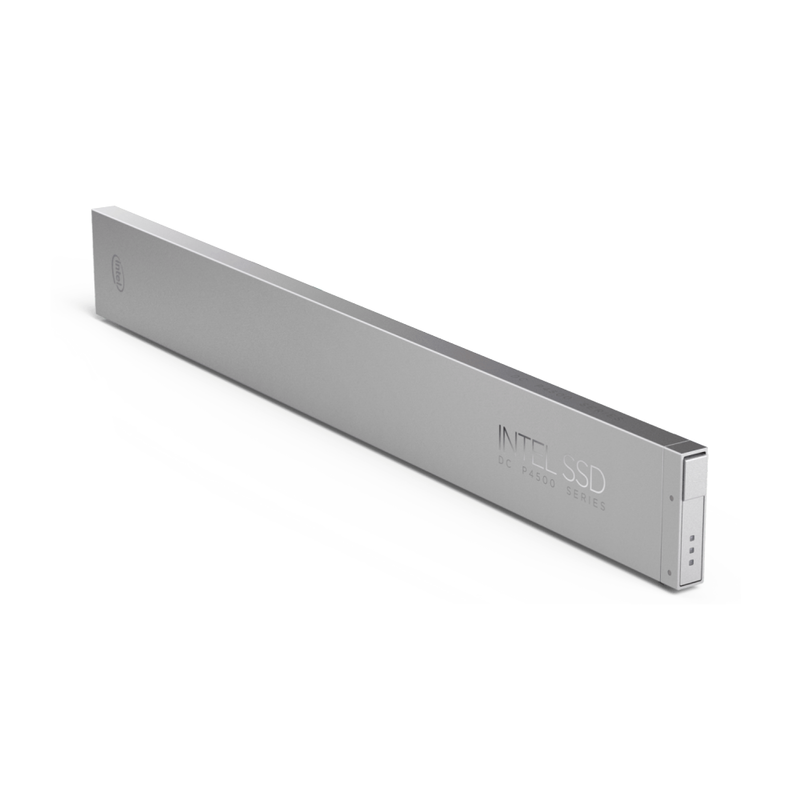 In addition, its efficient thermal design, integrated enclosure, latch, and LEDs improve overall manageability and serviceability, paving the way for a new direction in SSDs. The new purpose-built design represents a unique combination of technology innovation and common sense. 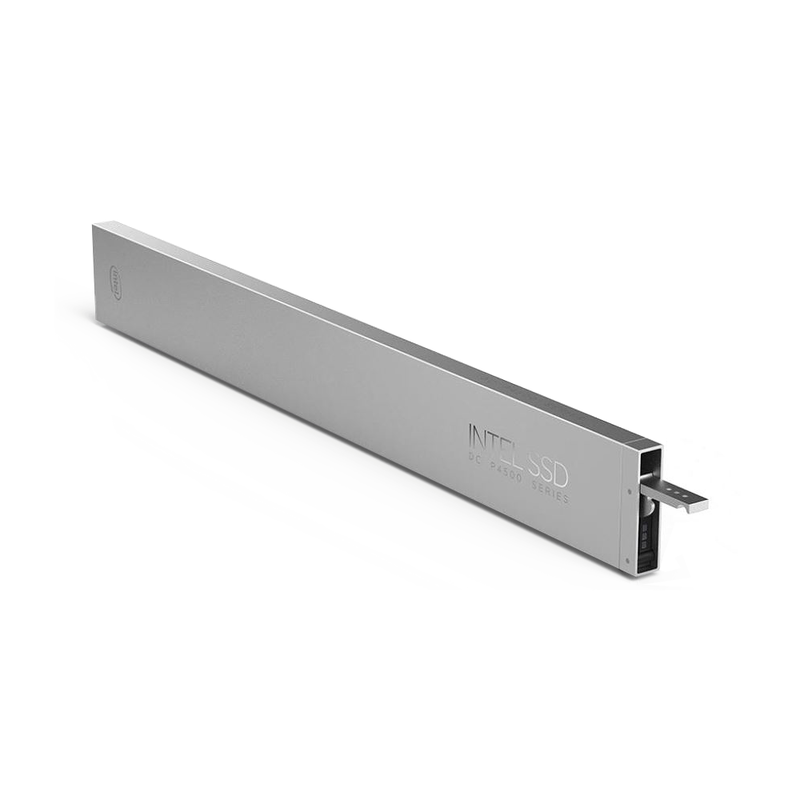 The “ruler” form factor features a height of 38.6mm, the maximum the 1U server rack can accommodate, while still allowing for a hot swappable module. More PCB real estate of the “ruler” allows for more NAND media packages per SSD. A dense drive-to-drive pitch allows 32 drives across 1U, while still being thermally efficient. Transitioning to the “ruler” form factor from other legacy form factors allows customers to reduce server Capex by up to 3x, enable consolidation from 6U to 1U for 6x improvement, and reduce the power requirements of the SSDs (not the servers, fans, backplanes, etc.) up to 2.25x less. The long and the short of it? The Intel “ruler” form factor is the measure of the future. New form factor maximizes capacity while fitting into a 1U server rack for high per-drive, per-server, and per-rack capacity. Efficient thermal design enables consolidation and lower-power requirements, improving operational efficiency. Fully front serviceable storage, includes hot plug, hot removal, and LED support for efficient management at scale. Links below open in new windows.